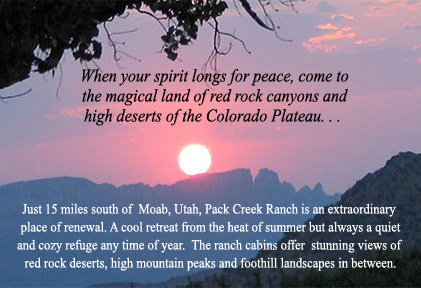 OFFICIAL website of Pack Creek Ranch House, Orchard House, Road House & the Lodge in Moab, Utah. Cradled in the foothills of the La Sal Mountains, Pack Creek Ranch cabins are just south of Moab and are spread out over 15 acres of land, most of it pasture. This small hamlet is part of an historic 300 acre ranch favored by visitors, locals and guests alike for it's moderate summertime temperatures, exceptional mountain and desert views and natural beauty. There are 10 fully renovated, individual houses all with an old west, log cabin, 'rustic elegance'. Most have rock fireplaces and fully equipped kitchens. Our secluded location means you won't find network televisions or telephone land lines so you can relax and escape daily pressures. However, high speed internet and some television options are found in most cabins. Not surprisingly, Pack Creek Ranch has been a favorite Moab area retreat for such notables as Edward Abbey, Terry Tempest Williams, Wendell Berry, Amy Irvine, Robert Fulghum, Wallace Stegner and Katie Lee. Actors Robert Duvall, John Wayne, Susan Sarandon and most of the crew of the movie Thelma and Louise made their base at the Ranch. Physicist Stephen Hawking and other scientists have asol enjoyed the unique and serene environment. Pack Creek Ranch is your Moab area base for year-round adventures. Arches and Canyonlands National Parks and Dead Horse State Park are only a short drive away. In addition to the red rock canyons and high deserts, the majestic La Sal Mountains offer stunning contrasts with alpine forests and snow capped peaks. White-water rafting and river tours on the Colorado, invigorating hiking excursions, world-famous mountain and road biking, 18-hole golf, dramatic sightseeing, bird watching, fishing, aerial adventures, ATV/jeep/motorcycle tours, marathons and other running events, cross country skiing — all this and more are within easy reach of our quiet and restful Ranch. truly enhanced our visit to the Moab area." peaceful places we have ever stayed."